So the long-awaited final report of the Auckland Transport Alignment Project (ATAP) was released yesterday. This is the third “deliverable” from the project, building on the “Foundation Report” in February and the “Interim Report” in June. The Final Report isn’t dramatically different from what was reported in June, although there’s a lot more detail – particularly around the timing of major projects. I’ll get onto that soon. First if you want to watch the announcement from Transport Minister Simon Bridges and Mayor Len Brown you can do so below thanks to Auckland Transport filming it. We need to move to a comprehensive, better pricing system – which ATAP calls “smarter transport pricing”. It suggests it could take a decade to work though the details before it became a reality. Northwestern Busway – a project we’ve long been calling for and should have been included as part of the current SH16 works – has been brought forward into the first decade. Remember this was a third decade project in the Auckland Plan. With the exception of some improvements to the existing rail network, there seems to have been an allergic reaction to the term rail for any new lines. Instead the report uses the phrase Mass Transit instead. There seems to have been a compromise on isthmus light-rail, with it now being a second decade priority. On the positive side, this project wasn’t officially in any of the plans before ATAP. The Early Rail Development Plan priorities include Pukekohe electrification and a third-main between Westfield and Wiri. I wonder if this means government is agreeing to fully fund these? A “mass transit” upgrade of the Northern Busway is now officially in the plans as a longer-term priority. Presumably this means to some sort of rail in the future. The Additional Waitemata Harbour Crossing project is not seen as required before the third decade (around 2040). Given that NZTA had previously been talking about it needing to be in place by 2030, this is quite a major shift. The major projects shown above are only those on the ‘strategic networks’ and there are a lot of smaller projects that sit below that. The strategic networks have also been shown in a schematic form too. The road version shows that while map above looks busy, there’s not a heap of new major roads on the horizon. The black arterial roads should also be AT’s basis for a bus lane network map. By comparison the strategic PT network shows that a lot of development is needed – and the government has agreed with this, also does it look familiar? I’m sure we’ll have plenty more posts to come on the details of ATAP as we sift through them over the coming days. But what’s perhaps most interesting is how ATAP has landed at a reasonably good overall approach, even though it seems to have come at the issue from a pretty “old school” predict and provide approach. Firstly, the project objectives are very focused around congestion – even though we know that higher or lower levels of congestion are a pretty poor indicator of whether a city is succeeding or failing. Secondly, the analysis (which is described in much more detail in the “Supporting Information” report) is very demand-led, predict and provide. It is the result of a massive reliance on transport modelling that we know has traditionally not done well, especially in the face of transformative change that projects like Britomart, rail electrification and the Northern Busway. We would have preferred to see a strategic, top-down, outcomes focused approach that focused on the jobs we might want different parts of the transport system to do. I guess the challenge with this approach is that it would have required all of those involved to actually agree to a vision for the city. One thing you may have noticed is missing from the report is active modes. This is in part because our transport models are hopeless on active modes and because “the views of central and local government are already well aligned on the priorities and likely level of future funding”. Hopefully that means more initiatives like the Urban Cycleway Fund are expected. Overall it’s a pretty big step in the right direction, especially in terms of having something the government has signed up to. At the briefing yesterday the representatives from the business and infrastructure lobbies were fairly dismayed at the outcome of the report, perhaps a sign it’s on the right track. They want to more built sooner but have also separately said they don’t want to pay more rates to enable that. The next challenge is of course how we fund it. ATAP estimates that over the next decade we’ll need to spend $24 billion but based on current budget trends, that will leave a $4 billion funding gap (mostly in the later part of the decade). With leading mayoral candidates promising to cap rate increases, it will make for an interesting few years while this issue is addressed. Regarding arterial roads, I think it is inevitable these need to move more people. After all isn’t this what LRT is about for example? Combined with other comments in the report I hope this ends up meaning more PT priority and less ridiculous parking. Agreed. Been an advocate of no parking on arterials 24×7, two lanes each way, common sense. As for motorways work must be undertaken to increase lanes at pinch points to maintain consistency and flow, which is the same principal as the rail projects. Having motorways reduce to 2 lanes at Sylvia Park for example is plain stupidity and must be sorted. I think any infrastructure work such as lane widening should be kicked out post road pricing. After road pricing is implemented we will have a much better idea around price sensitivity and therefore the value of investment. The report actually acknowledges this which is cool. Two lanes each way for cars won’t improve capacity at all. The capacity is already limited by intersections, which often have three or four lanes each way already, so having more lanes between the same intersections will do sweet FA. However having the second lane as a bus lane will hugely increase capacity, as it allows a much greater speed and therefore throughput of buses in addition to roughly the same throughput of cars. While I’m all for fixing the motorways along with the PT system, the Mt Wellington highway (Sylvia park) motorway bridge serves a purpose of an artificial bottleneck that helps the flow further up the motorway. It is not as simple as widening the bridge to three lanes there would also need to be major dollars spent elsewhere to have any positive effect, the best we can hope for is to see what happens after the ring route is complete with the SH1 widening at Takanini, the SH16 widening and hopefully a proper interchange at the Albany SH1/SH18 junction. Everybody from the Minister down all agree that it is impossible to road build our way out of traffic congestion. But it sure seems like they’re still determined to try. Every single millimetre of motorway that is possible to add is being added. This will of course have the opposite effect; for every little stretch that is temporally relieved will increase congestion globally on all roads and streets. That’s how it works, and that’s what the minister’s sound bite refers to. So do they really get how destructive trying to funnel ever more traffic through a city is? Or is there just too big a conflict between what the evidence tells them and what they are in the habit of doing, and what their systems and partners are geared up for? Reading the report in detail shows there is a clash between the headline and the programme. So, we are in the phase of doing the good things now while still trying to do all the bad things too. Which also explains the ‘Funding Gap’. I look forward to the next calibration, where even MoT will have to accept that we need to focus on the positive projects and not also build the negative old programme. 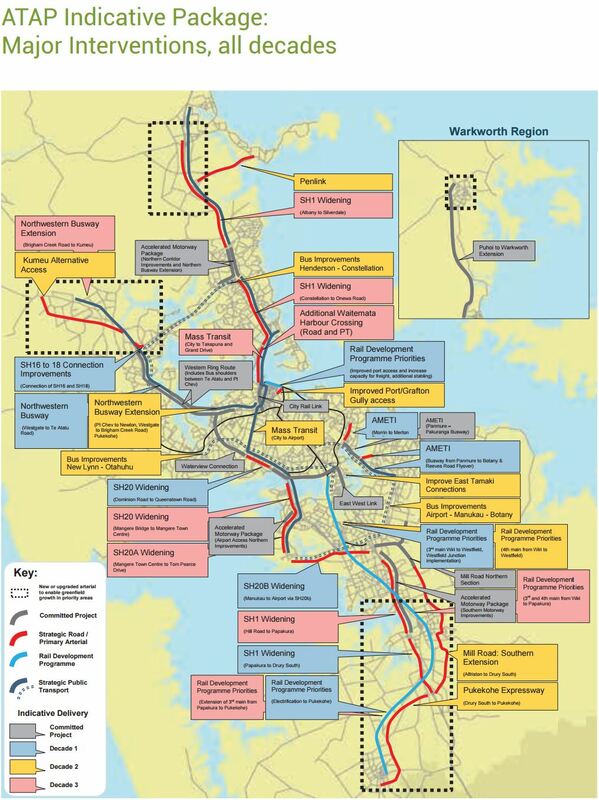 So the East West Link is a committed project. Can’t this be put on hold or cancelled, that would free up a lot of money for the next decade projects. Were is the supportive business case for this very expensive project that has come out of no-where, why is the NZ Herald / media not all over this? Remember all those idiots who told us Peak Oil would leave us with empty roads? Peak oil could still happen. I wouldn’t rely on the ART3 transport model to answer that question. It’s a tragedy peak oil didn’t happen. Oil companies are piling ahead, supported by governments like ours, and finding ways to extract way more oil than the planet can bear. They already have reserves in place that provide oil well beyond what we can afford to burn in terms of carbon emissions. Yet they keep going. While I get your point, if Peak Oil did happen then Auckland would be demonstrably poked. There’s simply no way that more of the populace could use PT as it stands. The new networks will go some way towards this, but we are a long long way from PT being a realistic option for *most* commuters. But if traffic volumes dropped, I guarantee lots of people would be out riding their bikes for free. With 40% of people making trips of less than 7kms in Auckland, there is heaps of potential for that. Very unambitious on the modal shift front, despite mode-shift being identified on about page 3 as one of the four key priorities. The graph on page 39 shows a modal split of 16.2% for PT in mid century versus 14.7% for what is already planned pre ATAP – so the difference after 30 years of ATAP is just 1.5%!!. Indeed their graph starts to flatten out rather than continue the present trend line which would take us well past 20% – possibly to 25% (still a long way short of most European cities but a good target to aim for). The good news is that one of the authors of the report confirmed to me that the ATAP will be subject to periodic review (say every 5-6 years?) so hopefully we can progressively shift money out of more and wider roads in favour of more PT investment. Although the final report has its faults, at least Wellington is now talking with us rather than just foisting more and more motorway projects on us out of the blue (remember the 4 motorway projects announced in 2014) – as has been the pattern for decades. Agree with that Graeme. The target of 16% public transport mode share is very unambitious, and yet this should be a key measure of success. 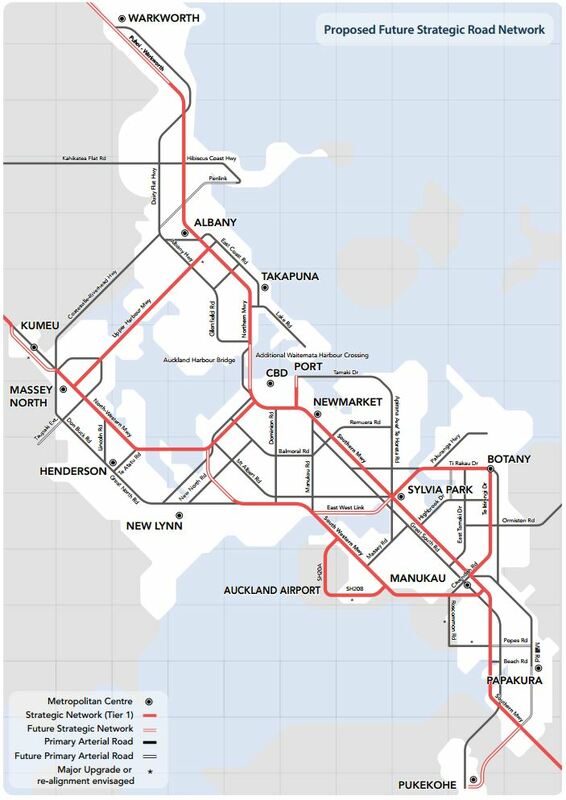 What’s also missing from both documents is public transport mode share across Auckland. I want to see, local board by local board, what percentage of residents will have access to frequent public transport (within 500m walking distance), and what the predicted public transport mode share is for each local board. The plan looks to be based on neglecting public transport over large tracts of Auckland, and then hitting those same residents with extra costs just because they are forced into driving. I already have ethical issues with AT denying people access to public transport without compensation (through rates remediation), so to go further and burden them with additional road use charges seems just unconscionable. There will be a rates remediation for people who don’t have good access to public transport in the future and have higher vehicle transport costs as a result. It will be as a result of a relative decline in property prices compared with those that have good access to public transport. 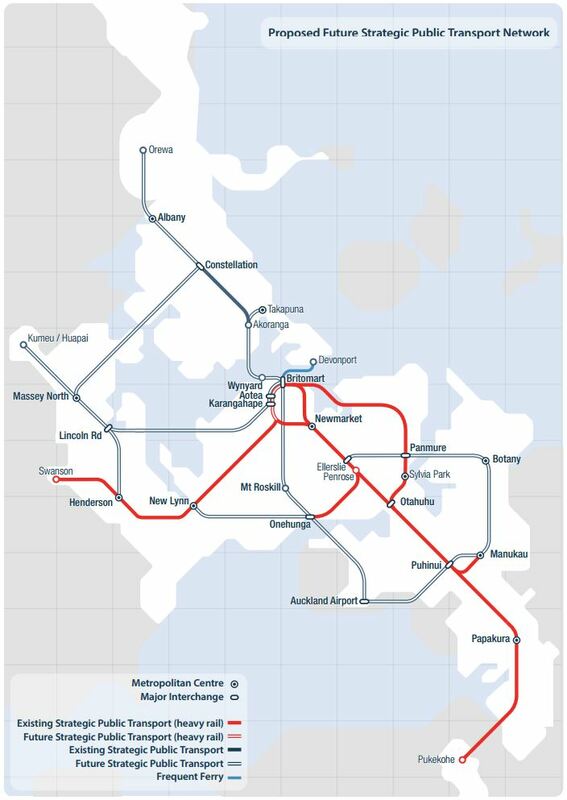 The vast majority of Aucklanders already live within 3kms of a train, busway or ferry station. That is a bus or bike ride of less than 10 minutes. Once the feeder bus services are improved and as long as psychologically auto dependent NIMBYs don’t oppose improved cycle infrastructure, very few Aucklanders will be “forced” to drive their car. That will be a choice they make which they can then pay for. Totally agree, that’s where we need to get to if we are serious about reducing vehicle traffic but it will require integrated fares and an expansion of the cycle and bus network (more feeder services and with 15-minute frequencies) to work. It’s about first making better use of the bus/ferry/rail infrastructure that we already have. In my opinion the problem is AT’s geographically narrow priorities – there’s no timetable for expanding the bus feeder network so that a majority of people outside of the isthmus can easily access it, the cycle lane money allocated for all of Auckland has been spent in the centre, and integrated fares (promised for Q2 this year in their statement of intent) seems to have disappeared under the radar. None of these three projects are difficult or expensive to do, and as the new cycle lanes have proven, the benefits that can be derived are high compared to the low capital spend required. AT knows how to do this stuff, but it seems that they lack the leadership and governance to do so. Integrated fares may have dropped of the radar because there is not much left to do. They went live last month. The plan that gets you to 14.7% PT modeshare has a lot of PT projects in it already. Most of which are carried forward and some done a bit earlier. Remember this is for ALL TRIPS. I think Vancouver sits at around 16%. So can AT now finally upgrade Dominion road or do we need to put up with cracked narrow footpaths and incomplete bus lanes for another decade or two? Completely agree with you. I think of Dominion Rd as the Rd everyone wants but on-one gets. Is it a motorway? Is it destined for light rail? Is it a series of neighbourhood shops? Meanwhile nothing gets done and the place is more and more run down – there are potholes 30cm deep in the Balmoral shops footpaths. Now with at least 10 years to go, I think they need to bite the bullet and give it the revamp it needs. How about removing all carparking (creating some more in the side streets where possible even if that means narrowing side streets), creating a two laned separated cycleway from one end to the other like the new one on Quay street. The cycleway would help the retailers. Then put bus lanes in both directions from one end to the other (get rid of the slip roads eg at Balmoral and Dominion that cause bus delays and bunching) and then car lanes like now. If we got rid of the carparks there would possibly be room. Follow this up with planting, streetscape, new pavements and it may even look like it was promised to in the revamps years ago. Those are good suggestions now that the proposed LRT has been pushed far into the future. I don’t think it was ever seriously proposed. It’s a PR distraction to lull people into accepting the dumping of new rail lines, and it’s worked well judging by the number of PT advocates who after years of pushing for new lines suddenly dropped their support for them, and thus there has been barely a fuss made over the dumping of rail to the airport and to the shore. Wave glossy pictures of smart looking LRV’s gliding along Queen St, and melt the heavy rail advocacy away. AT have known the contents of the ATAP (that LR isn’t in it) for months, but have continued to push LR as a near-term project whilst announcing the dumping of airport rail. They knew very well LRT was not in the near future, yet they have continued to push graphs at seminars and workshops showing LR patronage projections taking off in near-term periods. At the June 2016 Rail Conference they showed a graph of where they expected LR patronage to be by December 2016! Two months later they admitted the timeframe was not realistic and restated the date as hitting the first million riders in 2017…..
All that talk of replicating Perth, with new lines and massive patronage growth to be enabled by the CRL, flushed down the loo. Good to see some advocacy groups renewing the calls for heavy rail to the shore at least. We’ve all been lulled into accepting a premature end to Auckland’s rail network expansion, but the good fight must be fought. Erm, what are you smoking Geoff? Rail to the shore and the airport are both in ATAP, the are both now programmed and accepted by all levels of government. Where are you getting this ‘dumped’ BS from, they are finally approved! You clearly have no idea how much time, effort and money AT has spent on planning rail for dominion Rd and the airport if you think it’s some sort of smokescreen to not do rail! Here is a little reality check for you: The CRL is going to be full accomodating the existing network. I don’t know where you got the idea of new lines from, but the patronage growth on the current network is going to be enough to fill up the CRL. Sticking extra lines in services into it won’t work, we need new lines, new capacity, infrastructure in addition to the CRL, not in spite of it. Seriously guys, time to drop the negative-anti-everything is wrong-it’s all a secret conspiracy blather and get on with advocating for something. Simply moaning about everything always is no way to achieve anything, try being positive and proactive eh? If you don’t like what AT or “other advocacy groups” do then bloody well do something yourselves. What’s your plan? You budget? How does it get funded and programmed, staged and delivered? If you think you can do better then show us, please. One assumes it will now be going ahead. Hopefully with Median bus lanes given the current philosophy. I wonder what the cost would be to do the exact light rail project except with buses instead of light rail? Far more to deliver the same improvements with buses, as you still need to rebuild the whole dominion Rd corridor plus also need to build a bus terminal in town somewhere (presumably underground as there is nowhere to easily add 100 odd buses an hour to the network). Oh and you’d actually have to spend a lot more on dominion Rd demolishing buildings to build the stops, as a bus station takes up more area than an LRT one of equivalent capacity. Sure to build the same theoretical capacity, but on the basis that we are running buses for the next ~15 years anyway, we could build the same corridor now. Would not need to divert services. Costs would be a lot less. I don’t think it would achieve anything more than simply extending the current bus lanes. There is a large step in capacity and impact between good bus lanes and busway/LRT. Doing some sort of light median BRT would give you about the same capacity and performance as the current bus lanes, but with most of the cost of rebuilding the entire corridor. iMHO: extend/improve bus lanes immediately, then rebuild for LRT. Don’t try and do some halfway middle step. I dont know the Dom Rd lanes intimately, but every shoulder bus land I am familiar with in Auckland is highly compromised simply due to being a shoulder bus lane. Discontinuity at intersections, conflicts with driveways, breakdowns, parked cars etc. If you could have genuine continuity at intersections by having left turning traffic turn from the adjacent lane then that would improve things, but I imagine it would complicate phasing. The median is the natural place for public transport as it tends to be travelling straight ahead. Completely agree Matthew W. We can do median running buses as vanilla LRT very quickly. If you read the report it’s quite clear Dominion Rd itself isn’t the problem. It’s what happens in the city. Median bus lanes ain’t gonna do anything to resolve the problem of what happens in the city. Well Median bus lanes *in the city* will help. So will blocking private vehicles altogether from certain areas. Doubt median lanes in the city would help. The key constraint sounds like (from reading the supporting information) it’s the bus stops, kerb space and intersection spacing. Median lanes doesn’t change that at all. The main point of suggesting median bus lanes is to improve PT performance from a user perspective – yes they would help. Not to alleviate need for post 2030 LRT if it is required. The report is not suggesting we need LRT in first decade in any case. And after that only reccomends for a single route in 2nd decade so is hardly going to do much about bus traffic downtown for the forseeable future. However since you brought up the identified constraints. Thats because they are trying to run services that terminate downtown. You need to do this if you have poor bus priority to keep schedules. But with frequent buses and continuous priority along a route you wouldnt do this, you would through route just like with trains post CRL. So the issues of terminal space go away. Problem with median lanes is the stops. If you have lanes in the median you need stops in the median, which means you need passenger platforms in the median and pedestrian crossings or similar to access them. Then if you’ve not got the space for separate stopping and passing lanes for buses you actually get less capacity than the sides, where they can pass. That’s what I mean by there’s a big step from shoulder to median: you can’t do it cheaply or easily so it’s better not to try and do a halfway step. Agreed it would require investment, would like to see it compared against benefits. AT has published benefits of median running PT wrt proposed LRT and virtually all apply equally to bus. With regard to space, I doubt you would need passing ability on Dom. Symonds and Queen do have quite a bit of room in places particularly if you think about restricting vehicle access. I don’t agree with you there. The benefits of median running LRT aren’t transferable to bus in this context. The difference is the road corridor width, vehicle length and signal priority. You can’t do especially effective BRT in the median of such narrow roads, that is the key reason for having LRT (I.e. A lesser frequency of much higher capacity vehicles, running with full priority). You can do very effective median BRT, but you need a lot of room. It might work on Great North Rd or a handful of other very wide roads, but not on the old tram streets of the isthmus. The capacity of single lane each way median busways (that which would be the same width as LRT) is significantly higher than projected demand on the team routes. It’s only on Symonds that capacity gets interesting. Signal priority is a wash when you consider the impact of frequency on wait times. Signal priority will be limited to a certain amount of disruption per intersection per unit time. Mathew the frequency of buses required to match the capacity of large LRVs means four lane BRT, or at least passing lanes at stops. Buses need to be able to overtake as they quickly fill and clutter each others’ row. There just is not the width to provide for future capacity needs on busy and very constrained streets like Dom Rd with buses. As it is even for narrower and single lane LR stations are going to be tight. Buses could work if all other vehicles were excluded and Dom Rd were to be 100% BRT. Is that likely to be a better or more possible outcome than LR? And do city streets have the capacity to take all these buses? What problem are you trying solve? Patrick there is a certain capacity at which overtaking is required and it isn’t binding on our suburban arterials and won’t be for a long time. Pax per hour per direcation capacity of a system is not a fixed number but 5000 is not an unreasonable number. I understand Dom Rd is currently at maybe 1500 or less. What I trying to solve is the poor state of Auckland surface Street based PT system. Patrick there really is no width difference between single lane bus and LRT in a 50kph environment. I saw an example the other day of 2.8m lanes for singleness two way busway! Certainly 3m is widely accepted. I’m not proposing the road is taken over, I’m actually proposing the street and intersection layout is configured howith it will be for LRT in case. Paving the way for LRT so to speak. Heck if capacity constraints do start to bind the case for LRT earlier will be essentially made! As a political argument it’s quite compelling for an LRT advocate I would have thought: we can’t have LRT now so let’s give buses the same priority and see how popular it is. If it goes off LRT here we come. Chloe S has hineed at this as her position hence I just voted for her. Not so Mathew, overtaking is already required around busy stops, it’s what lets them operate relatively effectively. One at a time stops limits you to about 15 buses an hour reliabily. If you don’t have overtaking you end up bunching to the weakest link, you’re dwell times end up a factor of the weakest links of two, three or more buses attempting to work in concert. 15 LRVs on the other hand, also reliable inline but with about four to five times the capacity as 15 buses. YOur lane assessment is a bit arbitrary, let’s say we are happy with minimum 3m lanes. I wouldn’t be, because a bus with its wing mirrors is about 2.8m wide. Kerbside bus lane have the kerb channel and footpath to hang over on one side, and the adjacent lane in the other. Anyway, in the median you need about a metre separator between the two oncoming lanes so the buses don’t smash into each other, and a half metre buffer either side to have separators to keep traffic out of the busway. So already you’re looking at eight metres just for the buses. That’s a metre more than LRT which doesn’t need as much buffer because they run on rails. Then at the stops, you need two side platforms of about a minimum 3m each for buses, with LRT you can get away with one island of about 4m. So you bus stations are a good 14m wide. Given dominion Rd is 20m wide and you need to keep the two traffic lanes and the two foopaths then the stops certainly aren’t going to fit. That’s a lot of buying and demolishing buildings required. I know it seems very attractive to think you can always do the same with buses, but you can’t. They aren’t the same. Likewise this idea of building busway first then going to LRT, it’s different widths, different platforms, different sizes and geometry. Yo could build the bus thing, then rip it out and start fresh, but it means shutting down your buses while you do it. If you want to build median busway then fine, but to try and do it in the same footprint as LRT will leave you with something that performs worse than the current buses. Plus you’ll also be stuck with a sunk cost issue of nobody every having the appetite to shut it down and rebuild it for LRT after having just spend hundreds of millions making it a busway. You can make the stops longer than 1 bus only. No you dont need a 1m median, that is simply not used in many other places around the world for a 50kph environment. Maybe if we are running 80kph buses, but that isnt proposed for the LRT as far as I know. Similarly side barriers between general traffic – there is no absolute requirement for this either. You dont need stops for both ways adjacent to each other, this just isnt the normal practice elsewhere for this application, you would have stops on opposite sides of an intersection, so the 2x3m vs 1x4m isnt relevant. In fact you get a narrower overall width with buses with staggered platforms vs LRT with centre platform for your dimensions. So nothing you have said ends up with a wider ROW for buses vs LRT. The whole point is you are not building it from scratch, the pavement is already there. Ok sure Matt, you don’t need all the things that would make median buses better than kerbside lanes… But if you don’t do it your just spending money and creating disruption to get something that’s no better, and quite possible worse, than what we have already. That’s right back to my original point, there is no cheap or easy way to do effective median busway. If you want it quick and dirty, you’ll not gain anything. If you want the big gains, you need to spend big on infrastructure and land. TANSTAAFL, if it were so cheap and easy and effective they would be everywhere, but in practice they’re only seen in broad multilane avenues. Reduces interaction with cyclists and pedestrians. Allows for higher operating speeds. Eliminates the impact of road traffic slowing down to turn left. Minimises congestion by allowing light rail to travel separately. What dont you get from the list above that you need to spend hundreds of millions on that will be non coincident with LRT investment? Vehicles that can handle 450 people each yet load with less than 30 second dwell times. To get all of that *and have it fit in the likes of Dominion Rd* limits you to a throughput of about 15 vehicles and hour, 20 tops, with any kind of reliability of trip times and operations. Doesn’t matter if that vehicle is a bus or an LRV. So sure, you can do all of that and run 15 double deckers an hour, and those 15 will perform very well, but you’ll be leaving most people behind at the stops because that’s no more capacity than we already run. Try 60 an hour. That is just a ridiculously low arbitrary limit. There is absolutely no way you can get 60 buses an hour through a single inline stop with any kind of reliability. Consider we have 120 second signal cycles. That means at 60bph you have two or three buses in a bunch automatically, so you have to cycle a platoon of buses through your single inline stop. That means a constant stream of buses backed up, then inching forward according the stop start schedule of each one. End result is a tailback ten or fifteen buses long after the first fifteen minutes of operation, and all your buses stuck in the first half hour without any of them getting back to do a second or third run in the peak. That’s a recipe for disaster. Seriously dude, you can’t magically make buses work where they don’t work. You have stops 3 buses long, not 1 bud long. No different from LRT. Matthew here you are being as stubborn as a rail fanatic. It just is never good to start with a favourite mode and then spend your entire life trying to shoe-horn it into even single application. Horses for courses. Please start with the need and the conditions and from there to the likely best solution. Bus-lover, train-lover, car-lover; all present the same problem. It is always confirming when both the bus-o-philes and trainspotters are criticising a position we support; must be close to getting it right. Im being stubborn? The reasons why LRT is so necessary right now are like shifting sands. Weve had strawmen about corridor widths (not even related to stop spacing) brought up again today. Strawmen about certain corridors being off limits to decent amounts of buses. Strawmen about buses needing a downtown terminal. Now strawmen about 15 buses an hour!! All the while AT have produced absolutely nothing that assesses these issues. Somehow building a decent right of way for buses “isnt necessary” because it wont do anything. It simply beggars belief. We have places in Auckland (probably most of Auckland) that are effectively going to be serviced by surface street based bus PT indefinitely and improving the quality of that just doesnt seem to be important to a lot of people. Im beginning to think a lot of people here have been fairly well captured by AT. Alot are probably dependent on in for their paycheque so thats not too surprising, but it is a little disappointing. Please give it a rest Mathew, I myself am very skeptical about LR on Dominion rd due to the width of the road but know very well that median running buses require even more room then LR (something I’m still not convinced will fit). Buses will also require sufficient bus stop areas that will have to be placed on the road (currently part of the footpath area) and won’t have the advantage that LR does of having doors on both sides to take advantage of island platforms where there is limited space. I have had long debates with Nick, Patrick, Sailor Boy and others over LR on Dominion rd and even I wouldn’t even think of trying to convince people that median running buses would even be remotely as efficient as rails of any sort. Bigted, as I say above I get a bit tired of strawmen being thrown out like you have just done. Platform widths have already been discussed above – tl;dr you have dont need to (and normally wouldnt) put bus stops for each direction opposite each other. Nor would they be for LR; that still does not enable enough space. Bus throughput at the desired future capacity simply does not fit in the Dom Rd cross section, as it is LR will be a squeeze at stations. I don’t know why you won’t accept there are structurally different capacities between these modes at fixed widths. Yes BRT can get up to the LR capacity but only with four lanes, not two. We get you really would prefer buses to work here, but they won’t, and if we stick with them both the street will fail for all users and potential PT pax here will not be able to be met. Which will lead to more trying drive, and therefore even worse outcomes. So, it might seem odd but LR is favoured here because buses are being so successful now, which, incidentally, is also the best argument to take quality bus systems to the two areas that are currently underserved by PT and consequently have low ridership: SE and NW. Which happily is the plan. And maybe these too will one day along way off also require the same upgrade. Do you have a reference for the capacity, I am curious. The only published value I have seen has something well south of 2,000 pax/direction/hour in 30 years time. That seems low to me but is not close to bus capacity either. I mainly brought this up in the context of ATAP – no LRT for 15 years and even then only on one line. Thats the position. Why not therefore build the best bus based system we can within the existing corridor – not only on Dom Road but actually on all the other isthmus and other routes as they aint getting anything else in the forseeable future. If we end up “inducing demand” to the point that LRT becomes urgent all the better. If people want to run actually continuous shoulder bus lanes instead that is great, but it will require a serious change in design methods / enforcement and culture to achieve. Yes very easy to label anything inconvenient about bus planning as a straw man, but unfortunately in practice there are real constraints. Turns out buses aren’t infinitely effective in every context. Three bus long bus stops aren’t the same as one LRV, in reality you can’t coordinate perfect platoons of buses to all arrive, dwell and depart in concert every two minutes, certainly not if they can’t overtake or pull around each other at stops. You’d be lucky to go ten minutes before one bus doesn’t clear the stop in time and you have another three buses backed up, which then don’t clear the stop, etc. Just go stand at Sunnynook station and watch the operation of 60 buses an hour. Then think what it would be like if there was only two lanes instead of four and no bus could proceed until the one/s in front of it had finished and also cleared the bus stop. Or think what dominion Rd would look like if you tried to build Sunnynook station in the middle of it. Costs are not a linear scale to distance. Nor to density for that matter. Both distance and density matter. and in addition to that, there are “step changes” in requirements when certain boundary conditions are exceeded that require significant changes in the type/scale/speed of associated infrastructure. Surely mass transit/light rail to the airport and the North Shore should be built in the next decade. When you factor in the inevitable time slippage it could be forty years before some of this stuff’s completed. A lot of cities are doing this sort of thing now, not in decades to come. The Shore already has access to an incrediblely piece of infra. If advancing LRT to the Shore now means someone else missing out (again) then it’s not really that fair. It was a fairly sore point for commuters from other parts of the City when the NEX services got their own bus passes at special rates. Maybe it’s time the other parts of Auckland got a look in first and a chance to catch up. However, if the question is ‘should there be extra funding to bring forward LRT in the Central isthmus, NW and Botany/AMETI links, AS WELL as the Shore?’, then the answer is very different. Anyone have more detail on the Taupaki Extension “Future Primary Arterial Road”? It’s the first I’ve seen mention of this. Isn’t Taupaki outside the RUB? I haven’t heard of it referred to as the Taupaki extension but there has been talk about a Kumeu bypass for many years now. There is also a Kumeu bypass shown on the map further north. This is something separate, as if a new road were to be built west from the Don Buck Road/Fred Taylor Drive/Hobsonville roundabout. There is ongoing urban development north in Kumeu and south at Red Hills, but nothing planned for Taupaki AFAIK. 1. More road lanes across the harbour do more harm than good, particularly to road networks, ie creates congestion everywhere including CMJ and SH1 [ATAP does not consider place value so no mention of bad outcomes for city streets or NS local roads]. 2. Busway itself likely to be unable to cope by at least mid 2030s, city streets much earlier from bus loadings. 3. Capacity required for trips from Shore to City requires rail based solution or very major city bus tunnels. Either way a new crossing. Only logical conclusion is that Rapid Transit only crossing needed next and way sooner than any new traffic lanes. Case is essentially now made for a rail only next harbour crossing [bus will still be evaluated but without any cost advantage is unlikely to score better – IMO]. Gosh, it really is a traditional transport planner product, then. ATAP also entirely ignored the Active mode. Not out of conspiracy but rather because what is hard to count doesn’t get counted. So alas, what counts isn’t always counted, and what’s easy to count isn’t always what counts. Understood. Having worked with some I kind of get what moves em. Motorised vehicles are the reference unit, and anything/body else is a hindrance. In his Get Welly Moving presentation last week, Barry Mein (now GWM, previously ATAP) said that reconciling vehicle movement and place making had been challenging for ATAP (see p7 of http://www.getwellymoving.co.nz/assets/Uploads/160907-Conversation-Series-Barry-Mein.pptx), with the clear implication that ATAP had at least attempted such a reconciliation (and hence so would GWM, which would be very welcome news). Did this not in fact happen? They do certainly model for land use, but that’s different from measuring impacts on place quality however [especially from vehicle volumes]. 49. Land use lies at the heart of travel demand patterns. The location of Auckland’s households, employment, education facilities, port, airport, factories, distribution centres, hospitals, shops and recreation opportunities determines trip origins and destinations. Imbalances between the location of household and employment growth will increase pressure on the transport system. • Encourage housing growth in areas with better access to employment and more transport options, such as around the strategic public transport network and on the isthmus. • Encourage employment growth where transport connections and options are strongest and where additional jobs would reduce reliance on long commutes across major transport bottlenecks, such as in the west and south. Post request: can TransportBlog please publish a more logical schedule than ATAP, prioritising separated public transit investment. I have to ask: Why are more roads bad and more rail lines/LRT good? It’s not that simple, but basically we have a complete roading network already so more/wider roads creates more traffic with little or no increase in mobility, and from a fiscal perspective it’s a very diminished return on investment. More rail/LRT however does not increase traffic and massively increases mobility, with a much better return on investment because the network is far from complete or comprehensive. Plenty of exceptions to that of course.